New York, NY–BBC Studios revealed the first look at the new toys and apparel for the upcoming season of Doctor Who, starring the first female Doctor, ahead of San Diego Comic-Con (SDCC). Doctor Who licensee Titan has produced two limited-edition 6.5” vinyl collectibles for the upcoming season: a Thirteenth Doctor TITAN, and a Thirteenth Doctor Kawaii TITAN, both of which will debut at SDCC 2018 in the BBC Shop at BBC AMERICA booth #4129 and at Titan Entertainment booth #5537. Following Comic-Con, remaining supplies of both TITANS will be available to buy at Hot Topic and shop.BBC.com in the U.S. and from Forbidden Planet in the UK. Pending availability, pre-order for these opens after the close of SDCC 2018 on Monday, July 23. 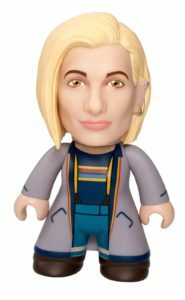 From Funko, the Thirteenth Doctor Pop! will be available at SDCC 2018 in the BBC Shop at BBC AMERICA booth #4129 and at Funko booth #5341/5347, as well as in retail in both the U.S. and UK this fall. A new Doctor also means new costumes and Her Universe is debuting the Thirteenth Doctor’s fashionable rainbow striped top, long coat, and blue trousers, which will be available at the Her Universe booth #1321 and later in the fall at Hot Topic stores in the U.S. BBC AMERICA will host a Doctor Who panel on Thursday, July 19 at 11:45am PT in Hall H, introducing Jodie Whittaker as the Thirteenth Doctor. Marking a new era for the legendary Time Lord, Whittaker will be joined on the panel by two of her Doctor Who co-stars, Tosin Cole and Mandip Gill, who play Ryan and Yasmin respectively, as well as award-winning series showrunner Chris Chibnall (Broadchurch) and executive producer Matt Strevens (An Adventure In Space And Time). BBC AMERICA will also have additional exclusive Doctor Who merchandise from BBC Shop available at booth #4129.